If you are a current Murphy's vendor, OR have product that we already have bought -- please log into your vendor center account HERE to upload information and/or assets. Stand with some of the most innovative Magicians in the world: Yigal Mesika, Paul Harris, Daniel Garcia, Eric Jones, Will Tsai, Titanas, Jeff Kaylor, Luis De Matos, and Shin Lim. o you have a PRODUCT READY to be unveiled to the magic universe? Great! Complete the form below and a purchaser will contact you right away to iron out all the details (if we want to pick it up, quantities, timing, marketing, money and all that stuff). ot an IDEA needing production, marketing and development? -- Keep reading! Do you have a magic trick that is ORIGINAL, UNIQUE, VISUAL, and AMAZING? Want to start on your production right away? Then send us a video clip of your latest creation! The best way for our team to determine if you have the next big thing, is to send us a video clip of your BEST performance of the effect along with an explanation of the method. Q: Will you respect my rights to the creative property I send you? Your method will stay with only a SELECT few of our team. We require a sample of your method or gimmick in order to determine practicality, marketability and uniqueness. In respect of other creators, we must ensure that your method is original. We will never tip or release your work without coming to an agreement with you first. Q: Will I get my trick produced? Certainly not in all cases, but those who put the most work into their effects have seen that hard work pay off. It's important for you to do the research and make sure your work is original and hard-hitting. If you are unsure of your effect's origins, feel free to submit it to us, we will help in determining originality. Q: How does Murphy's choose effects for production? Your demo makes our eyes pop and stomachs flutter. Your effect is created directly and personally by you and is not a copy or imitation. Your effect has marketability. Just because it is good magic doesn't always mean it will sell well. Your effect is practical to perform and can be easily taught. Q: Can I get a few more tips? Let's face it. So much material in the magic industry gets recycled. We've seen every pick-a-card / find-a-card trick in existence. Show us something we haven't seen before. The reality is that visual magic sells the best and therefore has a higher chance of being produced. Your work should make us leap back and question modern physics. Use good grammar, spelling and English. Put time into your pitch. Help us understand your magic. Show us what your spectator would see. We want your completed routine so we can get a clear idea of how to produce it. Sell to us! Any magic that makes us jump back and say, "&#%@*"! Q: I've got what you want, but what can Murphy's do for me? If we choose to produce your magic, it may be part of our 'Black Label' product line. Those effects get the best exposure that Murphy's can offer. Facebook, Twitter, YouTube, Podcasts, dedicated email blasts, Q&A, interviews, magazine ads in Genii, Vanishing, Magic Mag, forum posts, online banners and ads. The works. 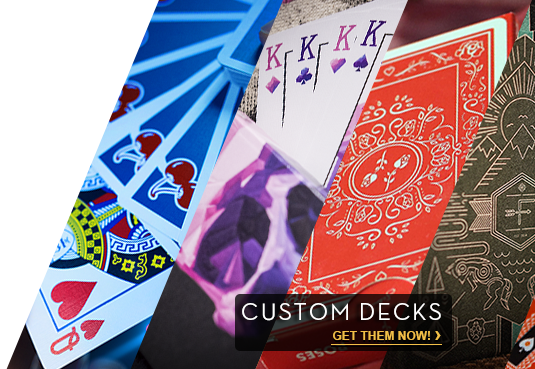 Additionally, we have over 25+ years of aggregate magic marketing and production experience and have launched some of the top magic products ever released. You will be filmed in a million dollar studio. Our cinematographer, producers, and graphic artists will ensure that your image and brand will be the talk of the industry. We don't hold back. NOTHING. We pay for EVERYTHING. Your travel, the filming, the editing, the marketing, the advertising, manufacturing, fulfillment, shipping, ordering, replication... everything. You just sit back and collect a well-earned royalty check. Ready Trick is ready for market. Production I want you to produce my idea. NOTE: Due to the number of production requests we receive, we will only be able to reply if we are interested in producing your magic; we cannot provide general feedback for your submission. considered for production. Your secret is safe.